We reported last week that Apple would be releasing the iOS 6.1.2 firmware before February 20th and this is exactly what the fruit company has gone on to do. 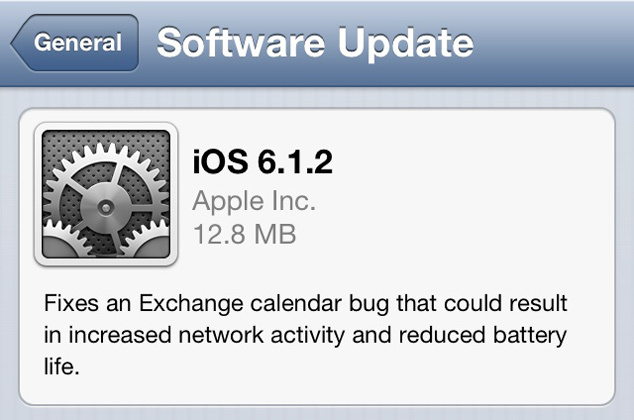 Only moments ago Apple released iOS 6.1.2 to the masses and it includes bug fixes for the Exchange calendar bug that we previously brought to your attention. This Exchange bug was so bad that AOL had to temporarily disable the ability to manage meetings with Exchange on devices running iOS 6.1. As a result it worked closely with both Apple and Microsoft to come up with a solution. The update weighs in at about 107 megabytes and can be downloaded over-the-air or through one of the direct links shown further down in this post. For those of you who are Jailbroken on iOS 6.x, do not update to iOS 6.1.2 until we get confirmation from the Evad3rs whether or not Apple patch the Evasi0n exploit. We will keep you updated when word is available whether or not iOS 6.1.2 is Jailbreak safe. Until that time please stay tuned. Update #1: iOS 6.1.2 is likely jailbreak safe, an Evasi0n update should follow shortly. More information is available by clicking here. Update #2: Evasi0n 1.4 has been released with support for jailbreaking iOS 6.1.2 untethered on iPhone, iPod Touch and iPad. You can download Evasi0n 1.4 by clicking here. Update #3: Learn how to jailbreak iOS 6.1.2 untethered on the iPhone, iPad or iPod Touch with Evasi0n 1.4 by clicking here. I have been having problems downloading IOS 6.1.2. Said unable to build request, error 21, error 6. I need this since I was effected by exchange issues & I have 2 accounts i need. UUUGGGGHHHH. Anyone else run into this issue. I did the update thru itunes. It gets to where it’s trying to download to the phone picture of apple & the space below never fills it just stays blank then it aborts & say’s unable to complete request or another stupid error message pops. I was able to get it out of the plug into itunes screen eventually & it went back to my 6.1 software, but it will not load new IOS 6.1.2 for some reason. Very frustrating. i have jailbrake my iphone 5 but i need to conect in to itunes to update my iphone because via AIR doesn’t came out? Now I’m getting an error that say’s cannot connect to itunes store & I just did a back-up & removed items from my phone. Really strange things going on with this update. It started with my phone showing 2 updates available but it will not let me see what the 2 updates are it just has blank screen. I can select other tabs & the info shows. Maybe I will have to restore again. I still haven’t done the jailbreak so it has something to do with apple not a jailbreak issue.